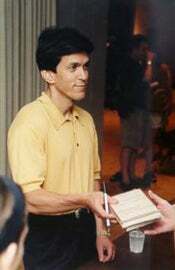 Mitch Albom is a fabulist all right, but not just in the journalistic sense. Albom is literally a teller of fables, a peddler of shallow morality tales for the masses. You can see it in his risible sports writing, and you can see it in his best-selling books. A representative of Starbucks, which will sell For One More Day as part of its new books promotion, told the Los Angeles Times that the chain wanted its literary selections to be "deeply felt." Albom's writing is deeply felt, and dimly thought. He's a huckster evangelist for the soccer-mom set. Curtis also brings up the oddly muted reaction to Albom's Jayson Blair impression from last year, which we always thought was swept under the rug in a bit too tidy a fashion. Of course, you might remember who went on CNN to publicly defend his "colleague:" Tony Kornheiser.